An article by Janine Copple Comments Off on Rambling Different Trails: Back To Our Regularly Programmed Spring. One thing I missed on our Big Tour was weather that didn’t require a hose-down every half hour. 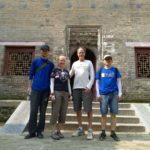 We arrived back in Zhoukou to temperatures in the 70’s. What could be more perfect? That lasted for a few days, then we got smacked down to the reality of spring weather. It’s changeable. 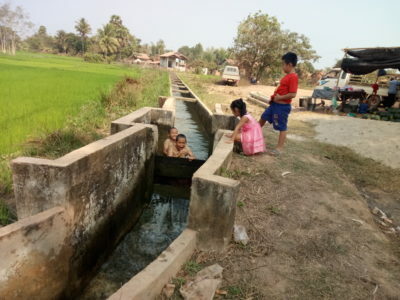 In Laos I wanted in that water, too. Thursday I had the opportunity for the first longish ride since being back. Believing if anything I’d be hot, I left in knickers and a long sleeved tee-shirt for the sun. The day was overcast, but mild, and the air was almost good enough to go without a mask. 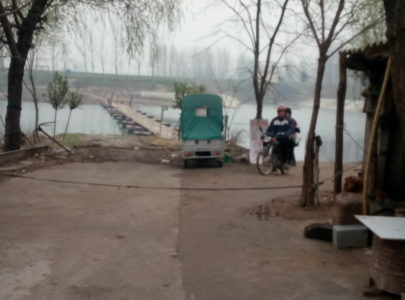 The Shahe levee road was dry and fast, and I didn’t notice until Deng Cheng, about a fourth of the way into the ride, that it had gotten hazier, and a strange darkness was building to the north. Not no much in the sky as in the air (the AQI was shooting up about 100 pm2.5). I thought maybe someone was burning debris. A breeze had started to kick up, but I didn’t know that a front was coming through and that things were going to change drastically over the next few hours. 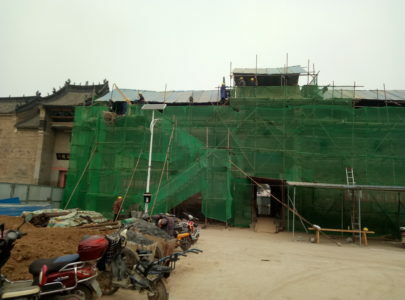 The historic manor in Deng Cheng is still under renovation. 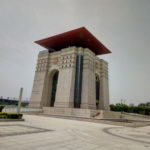 My objective was to be in Xiaoyaozhen for lunch and then on to see if the blossom festival on the Yinghe was starting. 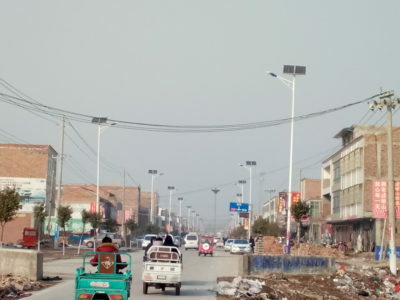 I wasn’t checking my map after I got off the levee to take the B roads because I knew if I kept the Shahe on my right I would eventually come to the highway and I could hop across over to Xiaoyao. Strange things happen to my bearings when the sky is completely overcast. With the twists and turns of the B roads I somehow crossed the highway without realizing what I had done until much later, when I recognized that I was halfway to Luohe. I was in territory I hadn’t visited before. In one village I had a sense I could have been in the old T.V. show The Outer Limits. Riding into town there was not a living thing to be seen (this is China, people seem to be everywhere). There were cars, laundry was hanging out, everything but people. I half expected a tumbleweed to blow across the road, with that tailwind. In the distance from where I’d come, a car horn was was honking incessantly. Just a little creeped out, I was relieved when I finally did see people on the other side of the village. Not far from there I came to a highway- and realized just where I was, and it was quite a distance from where I’d wanted to be. It got worse before it got better around Tanzhuangzhen. By this time the wind was strong out of the north, the temperature had dropped precipitously, and I felt a drop of rain. Not long after that I noticed my rear tire was starting to go soft. I remembered seeing my wind vest that morning but didn’t think to bring it, big mistake. The rest of the ride would be with a fierce crosswind, except when I was riding directly into it. All this on one of the meanest stretches of broken-up highway pavement anywhere. 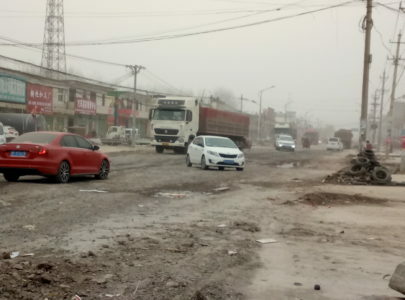 I managed to change the flat with half-frozen hands and was very glad to finally get back to Zhoukou, where I was nearly blown over. Another gust stopped my forward motion, and I saw a three-wheeler blown onto it’s side. Zhoukou rarely experiences more than a mild breeze. 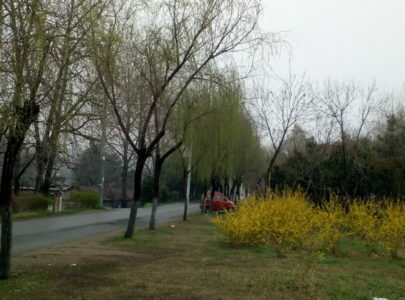 The willows are leafing out and the forsythia is blooming. I can understand the Chinese characters for “big wind” on my weather app, but not much else. It may have been unexpected. It’s spring, however, and one should expect that there can be big weather changes, so be prepared. I still don’t know if the blossom festival is going on. Rambling Different Trails: A Little Local Adventure. Rambling Different Trails: While One Attraction Opens, Another Closes. 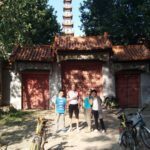 Rambling Different Trails: A Day In The Saddle To Xuchang.